Great Trips to Negril West End! 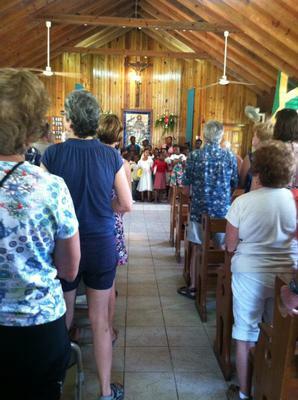 Picture Of Sunday mass in Jamaica! So for so many years we come to Negril, Jamaica! We started over 20 years ago at Foote Prints. Felt loved and cared for! Went on lots of wonderful trip with Leroy at FootePrints - Wonderful caring, sharing people! They made us feel like family. Over the years we fell in love with the 'beach people' and Shabba, ( Wayne), and took many trips to Ricks cafe! Lots of wonderful trips. We LOVE the people of Jamaica and have been to lots of locals homes for dinner- Love them and their children. We never had a bad experience in Negril! Felt love and gave love everywhere we went from church to local grocery store. We didn't make it last year due to one of our four being diagnosed with cancer. Already booked for March 2016! Got to think positive. So many friends in Jamaica! Been to Hawaii, Mexico and Panama but always come home to Jamaica!! Thanks for the great feedback my friend! I appreicate all Jamaica stories, but I particulary love to hear the ones that include the full and rich Jamaican experience, like yours. You even had dinner at local homes - doesn't get better than that! Of course, the basis is that you must have a good, trusting relationship. Rice And Peas and chicken? Or some sumptuous curried chicken and dumplins -lol. Don't answer, I am just kidding. By the way, I love your positivity too! I didn't quite get what or you said was diagnosed with the dreaded illness (most feared word in 7 languages) but I see that you still went ahead and booked for March! -that's the spirit my friend! So thanks again for taking the time to share with us on my site - and for the very kind words. Have a great rest of the day! Have a story like Julie's, please share it with us now- we love to hear em!